Search and adopt a Brussels Griffon near you. Intelligent, alert and sensitive. Full of self-importance. The Griffon Bruxellois or Brussels Griffon is a breed of toy dog, named for the city, Brussels, Belgium where they originated. 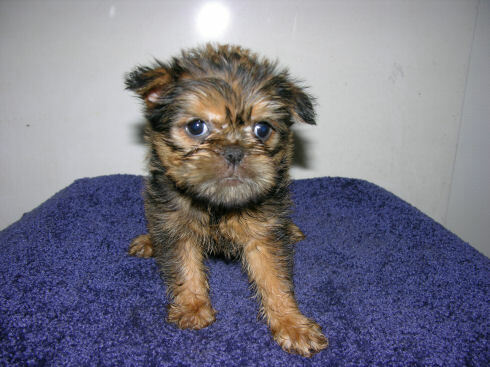 The Griffon Bruxellois may refer to three different breeds, the Griffon Bruxellois, the Griffon Belge or the Petit Brabançon. Identical in standard except for coat and colour differences. All three breeds are generally small, with flat face, prominent chin, and large wide-set eyes that give the Griffon an almost human expression. They are sometimes compared to an Ewok from the movie Star Wars and have been rumored to be an inspiration for that race to creator George Lucas. All three breeds are sturdy toy dogs with thickset, well-balanced bodies, giving a squared appearance in proportion when viewed from the side. A proper Griffon should be muscular, compact, and well boned. The Griffon often feels heavier than it is for such a small animal. Because they are judged by weight rather than by shoulder height, proper proportioning is essential to determine whether a dog is too heavy, too slim, or too tall for its size. The ideal weight is 8 lb. (3.63 kg) to 10 lb. (4.54 kg) for both sexes. The neck is medium length and has a slight arch. The chest is deep, and the back is level. The tail is either cropped to one-third its length or left its natural length in breed standards that allow for that; it should be set high, and when showing, should express the alert, keen demeanor of the breed. The head is the most important characteristic of this breed, and the most well defined aspect of the standard. The rounded head should be large in proportion to the body, without giving an unbalanced look to the dog. Depending on the standard, the forehead is referred to as "rounded" or "domed". In either case, the appearance of the skull should be of a circle (minus the features of the muzzle) rather than an oval, or the forehead should not bulge or protrude. The ears should be high, set well apart, small and carried semierect if left uncropped. Cropped ears are preferred in US show rings, but most European countries have banned cropping. The dark, wide-set, black-rimmed eyes are large and expressive, giving the face its essential human-like qualities. They should be prominent but not look bulging. The nose is broad, with wide nostrils, black, and set at the same level as the eyes. There should be a pronounced stop, and the muzzle between the nose and forehead should not be more than 1.5 cm in length. Some standards prefer the stop to be so strong as to leave no visible distance between the nose and forehead. The nose should angle upwards. The muzzle from nose to chin should not be in line with the face, it should slope towards the skull, giving a turned up or layback look. The broad chin should be undershot and prominent, sweeping up to the lip. The lips should be black, and close fitting. The top lip is short under the nose, and should not overlap the bottom lip. Teeth or tongue should not be visible. The upper lip should not be pendulous in any way. The teeth should be strong and straight, none missing or askew. In the Griffon Bruxellois and the Griffon Belge, the coat is harsh, wiry, and dense. This breed has little to no shedding. The coat should be short enough not to disrupt the form of the dog over the body, and long enough to distinguish the texture and type from the Petit Brabançon. Furnishings around the face form a fringe around the eyes, nose, cheeks and chin, but not allowed to grow into a long, flowing beard. Rather, they accentuate the form of the chin and cheeks naturally. The eyebrow, moustache and beard are essential to the human-like expression sought after in the breed. There may be some furnishings around the legs, though shorter than the head. To accomplish this harsh coat the hair is groomed with a technique known as stripping. This involves pulling out the dead hairs by hand. If the coat is left to grow naturally it will become soft and woolly. In the Petit Brabançon, the coat is short, straight, smooth, flat and glossy, with no trace of wiry hair. Its coat should look rather like the Pugs or Boston Terriers. 1. Griffon Bruxellois: Red or reddish-brown; black allowed on muzzle. 2. Griffon Belge: Black, Black and tan (a black and tan pattern with emphasis on a rich red shade), Black and red (black mixed evenly with reddish-brown hairs). Black and red may have a black facemask. 3. Petit Brabançon: All colours allowed for the other standards. Until recently, black short may have been a fault, but it is now allowed in all standards. A black mask is expected on the red or reddish brown coat. Grey hair from age is not penalized.